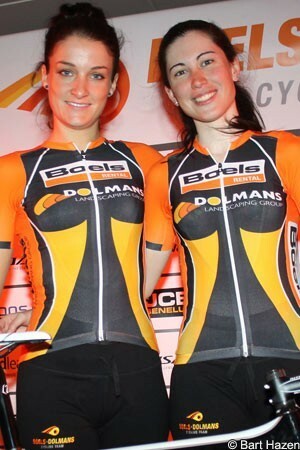 Boels-Dolmans will switch to Specialized bikes in 2014 in a three-year deal that will see the Dutch women’s team on the American company’s frames for three years. The team has been riding Issac bikes in 2013, but a big change in personnel for next season will also see a change of bike. “This top equipment gives us the confidence to realise our ambitions in the years to come,” concurred Erwin Janssen, owner/manager of Dolmans Landscaping Group. The news that the team is to ride Specialized bill doubtless be welcomed by its biggest signing for 2014, World time trial champion Ellen van Dijk, who has been riding the American company’s bikes since 2011, with HTC-Highroad and Specialized-lululemon. The 26-year-old won both the Netherlands and World titles aboard a Specialized Shiv this year and, with the Dutch powerhouse having signed for Dolmans-Boels through 2016, will stay on Specialized as she builds towards her next big target at the Rio Olympics in 2016. As well as its frames, Specialized will also provide the team with accessories and Body Geometry Fit measurements. Despite several changes to the Boels-Dolmans roster in 2014, the team holds on to British champion Lizzie Armitstead (pictured, left), who joined this year, as well as compatriot Emma Trott (right), who has been there since 2012. Among those joining next season will be former US champion Megan Guarnier from Rabobank-Liv/Giant, who rode on Specialized while with Tibco-To the Top in 2011 and 2012. Luxembourg champion Christine Marjerus also joins from Sengers Ladies, and also rode the American marque during her five years with Team GSD Gestion. With Specialized continuing to sponsor its eponymous team Specialized-lululemon as well as its new association with Boels-Dolmans, the American company will be providing bikes to two of the biggest teams in the women’s peloton. This will be matched by Taiwanese company Giant in 2014, which continues to sponsor World champion Marianne Vos’ Rabobank-Liv/Giant team, as well as taking over from US company Felt at Argos-Shimano.